The event will be streamed live from UNPO's Facebook. 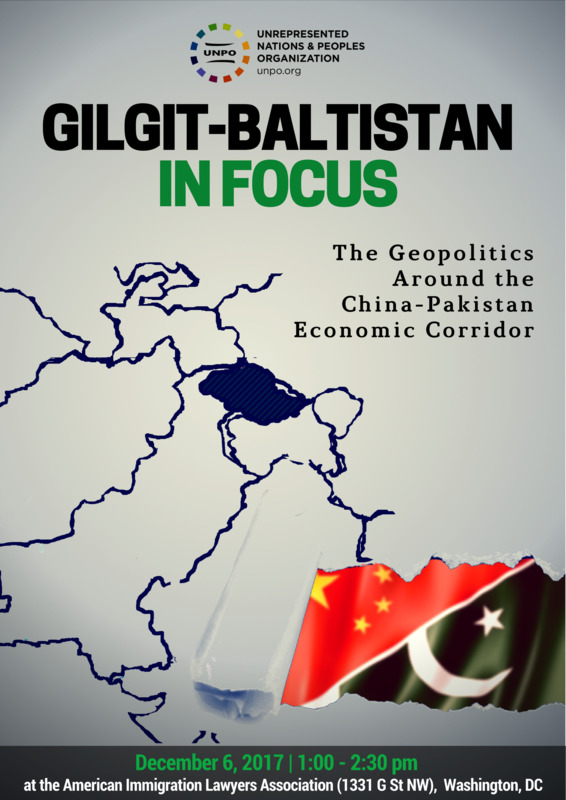 On 6 December 2017 at 1:00 pm the Unrepresented Nations and Peoples Organization (UNPO) will organise a conference entitled “Gilgit-Baltistan in Focus: The Geopolitics Around the China-Pakistan Economic Corridor”. The event will provide a platform for a critical discussion on the human rights and geopolitical situation in Gilgit-Baltistan. Speakers include Aliya Iftikhar (Committee to Protect Journalists), Jonathan Hillman (Center for Strategic and International Studies, CSIS) and Seth Oldmixon (Liberty South Asia). Ever since United Nations’ Resolution 47 had passed with no success in 1948, Gilgit-Baltistan has been occupied by Pakistan. For now almost seven decades, the region has been subjected to state-sponsored discrimination and violence. Disfranchised from political processes, harassed by outsiders, as well as being targeted by sectarianism – the indigenous people of Gilgit-Baltistan are direct victims of a constitutional limbo and all the consequences brought with it. Now, with the enforced implementation of the so-called China – Pakistan Economic Corridor (CPEC), new and even more severe hardships are inflicted on the people of this geo-politically important region. The infrastructural mammoth project is going to affect more than 400.00 people, leaving a large number displaced and their livelihood destroyed. Meanwhile, cultural heritage sites are being demolished and the region’s demographic systematically manipulated by Islamabad, reducing the people of Gilgit-Baltistan to a minority in their own territory. Contrary to the narrative put forward by Islamabad, the local population has been excluded from decision-making processes. Rather, Pakistan harasses activists who oppose the project, arbitrarily arresting and falsely charging them with “sedition” and “terrorism”, while actively and aggressively silencing journalists who dare to speak out against abuses committed in the region. Building on a series of events on human rights in Gilgit-Baltistan organized by UNPO in Europe, this conference will provide US researchers policy-makers and the interested public with a survey of the non-adherence to human rights norms in Gilgit-Baltistan, offering insights into the geopolitical and economic interests underlying this ongoing tragedy. The conference will provide a platform for and bring together the expertise of academics, researchers, human rights activists and civil society to discuss constructive approaches for the future of Gilgit-Baltistan. Speakers include Aliya Iftikhar (Committee to Protect Journalists), Jonathan Hillman (Center for Strategic and International Studies, CSIS) and Seth Oldmixon (Liberty South Asia).